Today, ninth generation José Antonio Zarzana (right), is in charge of one of the most idiosyncratic, but historic bodegas in all of Spain. 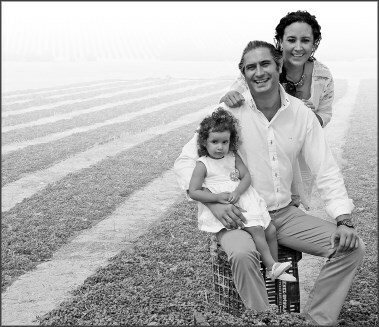 The direct descendant of Philipe Antonio Zarzana who founded Ximénez-Spinola in 1729, José Antonio leads this very quality-focused estate, with 20 hectares of organically-farmed vineyard in Jerez. However, those 20 hectares are highly unusual in being planted with only one grape variety, Pedro Ximénez. PX has been the sole focus of the family for almost 300 years, made in dry, off-dry, and dessert styles. I met up with Export Manager Alejandro Rosado Varela on a flying visit to Glasgow, who was delighted to be in Scotland given that the Sherry wine industry is so reliant on casks from the Scotch whisky industry to mature its wines. 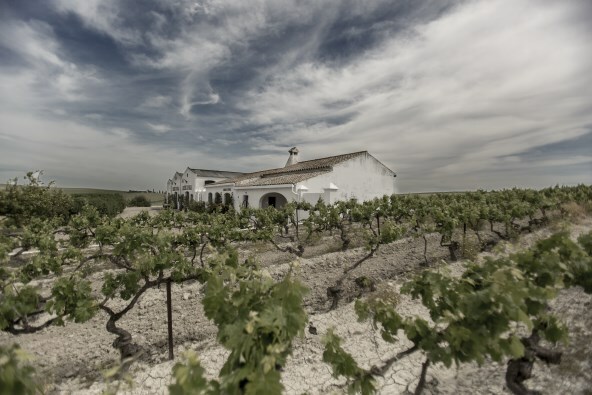 Though Ximénez-Spinola is based in the heart of Jerez, Sherry is a relatively small part of their production, other wines bearing the estate’s very own, official denomination of Varietal Pedro Ximénez. After three centuries the family also shows the same dedication to the solera system as it does to Pedro Ximénez, fractionally blending wines from multiple vintages into a complex final blend that can span decades. But the grape does seem like a magnificent obsession: “PX may have originated in the Canary Islands,” says Alejandro, “but the family believes it was planted originally in Spain in the early 16th century as Riesling. Five hundred years of thriving in our hot, southern, Mediterranean climate means the grapes and leaves look very different from Riesling today.” It might also explain why Ximénez-Spinola produces table wines in basically Spätlese and Auslese styles. Alejandro describes their production as “very niche,” which is something of an understatement. Each bottle is numbered and hand-signed by José Antonio. A ‘Family Council’ ensures production is limited, by far their biggest production being the Exceptional Harvest with around 20,000 bottles, but the rest of their five-wine range numbering just a couple of thousand bottles per annum. The dessert styles are made by drying grapes on mats in the sun, to dehydrate and concentrate the sugars. Interestingly, Alejandro reveals that the origins of this stem from the time of Arab rule in the Middle Ages, when production of alcohol was stopped, but local farmers convinced the authorities to retain the vineyards for raisins, thus starting the tradition. These really are quite exceptional wines, marching to their own beat, and certainly worthy of your attention. The wines are imported into the UK by Alliance Wine. (2017) The biggest production, but still only 20,000 bottles. Quite a deep colour from late harvest grapes, 21 days beyond the normal harvest. Fermented in barrel, but barrels filled little by little, 30 litres per day, into a 300 litre barrel. Aged on lees with battonage for six months. There is a Botrytis character, lightly earthy and a touch yeasty, a dry but vivid apple fruitiness. The palate bursts with a vivacious fruit but such a rich creamy texture too. The fruit really powers on, but very dry, a tang of salt and lemon into a long, taut finish. Dry with only 2 to 3g/l residual sugar. (2017) Also late harvest, fermented in steel tanks then aged in old Oloroso American oak casks. Darker in colour, there's more toast and a hint of marmalade, real richness and a suggestion of more sweetness to come. Indeed the wine has just over 20g/l of residual sugar, the unfortified late harvest sweetness is there, in its way delicate and Kabinett style, but the darker notes, the palate weight, barrel and the higher alcohol add significant lusciousness and a touch of spice. (2017) A white wine, but a burnished tawny colour after three weeks of sun drying on mats. Very low yields through that concentration. Skins are included in part of ferment, and it could potentially reach 17 abv, but part of must is fermented separately at lower abv. Four months in American oak. Lovely raisin and orange aromas, luscious with walnut and spice, clove-studded Seville orange. So easy to drink, unfortified, with a cherry freshness and red fruit brightness, but so much sweet syrup richness and sweetness, but retains that freshness. 350g/l sugar. (2017) Also from dried grapes and unfortified, but from the ancient solera started in 1918. More oxidised and chocolaty, spicy with some burnt toast, some marmalade, but dark, with more bittersweet promise. There's a dustiness and earthy character, that fine spice and raciness. Price is also for a half bottle.